Citi announced Dogtown Media as a winner of the Citi Mobile Challenge during awards ceremony in San Francisco. Dogtown Media showcased the Swift Mobile Banking App last month in New York City as an innovative mobile app to improve the in-branch banking experience for Citi customers. Citi formally announced Dogtown Media as a winner of the Citi Mobile Challenge during awards ceremony in San Francisco (http://cnb.cx/1FOrA7p). 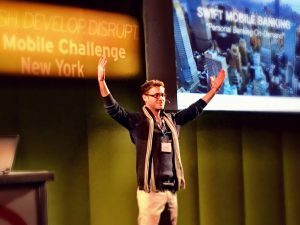 The Citi Mobile Challenge U.S., is a global initiative that invited mobile developers worldwide to disrupt digital banking by creating new mobile solutions for the financial industry. Dogtown Media showcased the Swift Mobile Banking App last month in New York City as an innovative mobile app to improve the in-branch banking experience for Citi customers. The Swift Banking App offers a window into the future of digital banking through creative use of BlueTooth devices pairing with mobile technologies. Out of 740 entries from 62 different countries that presented their mobile banking solutions in Miami, New York and Silicon Valley, Dogtown Media won over the crowd with their ability to truly innovate a new customer banking experience. The Swift Mobile App seamlessly integrates with Citi’s current mobile banking technologies, allowing customers to directly book appointments with branch bankers according to their own schedules and needs. Furthermore, at each Citi branch will be specialized Bluetooth “beacons” that alert bankers through an iPad when their customer is arriving at the given time. They can then meet the customer at the door, greet them, and get straight down to business. That’s not all… the bank representative will already be informed about who the customer is, their Citi account details and their needs. The mobile app also eliminates the need for clients to swipe their bank card and enter their pin code. No lines. No more wait times. Bankers will have everything pre-populated on their iPad beforehand. For Citi, this translates into a tremendous value in-terms of efficiency and effectiveness. Productivity is set to go through the roof as the infrastructure is laid and the process moves forward. Dogtown Media’s team couldn’t be more elated and humbled by the win. For them this is truly a worthy achievement that beyond the cash prize means they’ll see their app solution have incredible impact on lives across the globe.